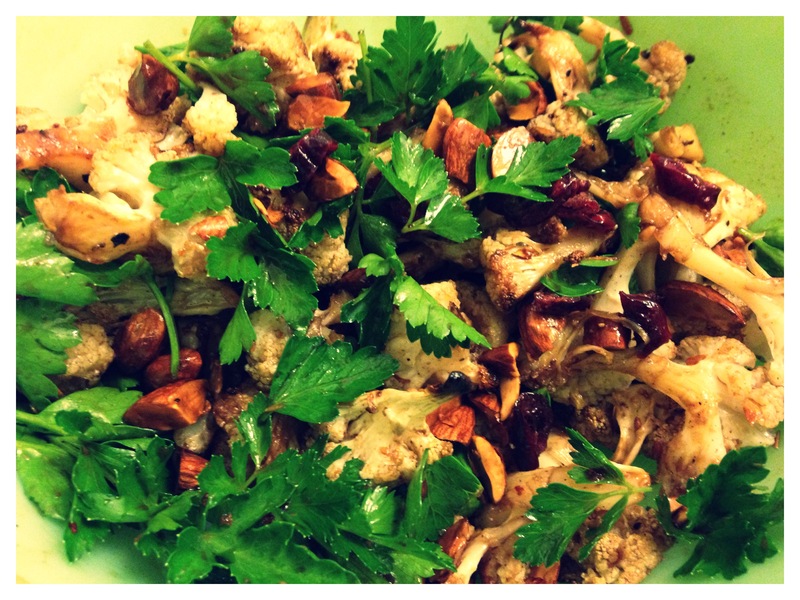 …and the cauliflower obsession continues. I cannot seem to leave the market without a head of cauliflower in my basket these days – sincerely. My most favorite method of preparation is to roast until golden and nutty and serve alongside some dal and pita. This afternoon, however, I was thumbing through my Jerusalem cookbook when a lovely recipe for cauliflower salad caught my eye. A few minor variations and voilà! It’s a relatively straight-forward recipe that comes together quickly, and can easily be made more substantial with a bit of grated, hard-boiled egg, or served alongside some dal or a filet of roast salmon. Preheat oven to 400. Toss cauliflower with olive oil, nutmeg, cinnamon and a pinch of salt and pepper. Roast for ~40 minutes or lightly charred, stirring about halfway through. Allow to cool slightly and then combine with remaining ingredients.